Ready to cry? 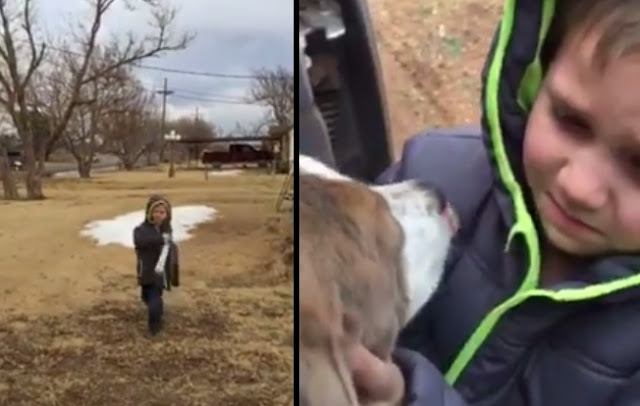 Paula Williams, a mother in Lubbock, Texas, posted a video on the city's “Lost and Found Pets” page on Jan. 8, showing her 6-year-old son, Khane, reuniting with their dog, Kase, who had been missing for more than a month. They had let the pup outside to use the bathroom on Dec. 4, but he was gone when they went to bring him in, Williams told Today. She noted on Facebook that Kase was microchipped, but they were still unable to locate him. The family panicked when a blizzard hit the region a week later. As it turned out, Kase wasn’t too far away. She explained to Today that that she spotted Kase when she was driving home one day behind a school bus. Two girls got off the bus -- and Kase ran out to greet them, she said. The boy and dog’s emotional reunion shows how much they clearly meant to each other. Responses to "Little Boy's Emotional Reunion With Lost Dog "